MoistureShield Infuse Collection Decking is available in 5 natural looking wood tones that will complement any home or cabin. 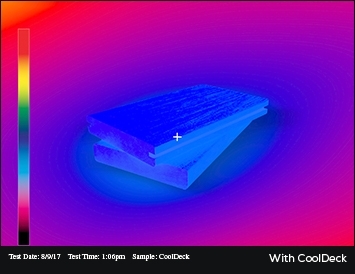 Two colors, Harbor Gray and Rustic Timber, are available with MoistureShield's innovative CoolDeck Technology making the deck boards cooler and more comfortable. MoistureShield Infuse Deck Boards are reversible, with the look of classic old growth lumber. Highly water resistant, Infuse deck planks are perfect for pool decks, lake side decks, beach decks, anywhere you have a deck next to the water. MoistureShield CoolDeck Technology allows you to actually walk on these boards barefoot, even in the middle of summer. 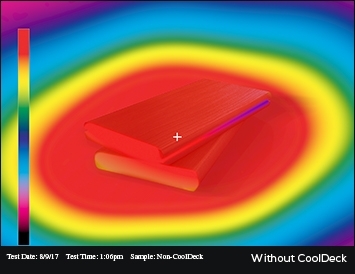 CoolDeck boards are designed to maximize heat reflection and minimize heat absorption, making the board much cooler from the start.